The Hiroshima-Nagasaki Archive was created by Hidenori Watanabe of Tokyo Metropolitan University in July 2010. Inspired by third-generation descendants of hibakusha to convey the reality of their ancestors, Professor Watanabe developed a digital mapping technology to mark the place and story of survivors. Visual Artist, filmmaker, and friend of Hibakusha Stories Shinpei Takeda travelled throughout the Americas to catalogue through art and film the stories of ex-pat atomic bomb survivors, from Canada to Brazil. The site is called Hiroshima Nagasaki Download: Memories from the Americas. Nagasaki native and atomic bomb survivor Akihiko Ito has devoted his life to collecting and archiving hibakusha testimony. Mr. Ito has assembled both video and audio recording of hibakusha who offer their memories of that day in August 1945. The site also offers slide shows of Hiroshima and Nagasaki before and after the bombing. An extensive English language collection is complemented by an even greater archive in Japanese. Hiroshima Peace Culture Foundation’s project dedicated to hibakusha is the Memorial Hall for Atomic Bomb Victims. The website and physical building host an on-line archive of photos, art work and testimony of hibakusha. The nearby Hiroshima Peace Memorial Museum provides a virtual tour online. Nagasaki City supports disarmament activism and the dissemination of hibakusha testimony through the Nagasaki National Peace Memorial Hall for Atomic Bomb Victims — a virtual and physical archive of photos, art work and survivor stories. The adjacent Nagasaki Atomic Bomb Museum provides classrooms for peace education and on-line information to encourage interactive learning. 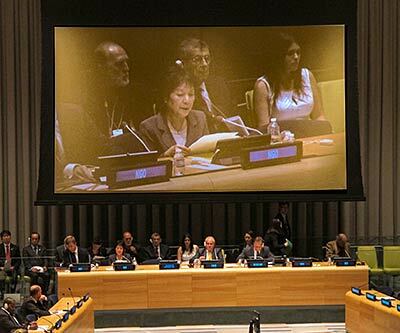 The Japanese Government has initiated a hibakusha testimony project as part of its commitment to advance disarmament education, pursuant to the United Nations Study on Disarmament and Non Proliferation Education. The Hiroshima and Nagasaki Archives are memory communities that have been created through the new technology of digital mapping. 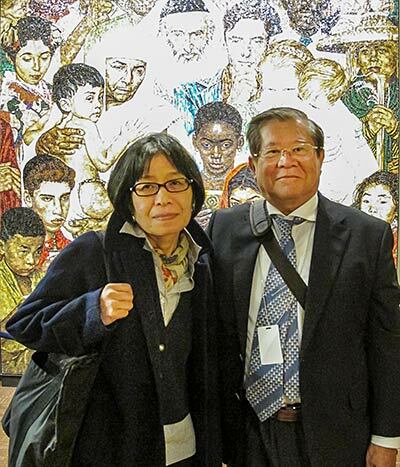 Hibakusha Stories helped produce a short film featured in the disarmament exhibit of the public tour route at the United Nations Headquarters in New York. This silent film conveys the importance of hibakusha testimony in 3 short minutes. Participating hibakusha, Toshiko Tanaka and Kunihiko Bonkohara were filmed at Dupuy’s Landing in Chelsea one of four private homes dedicated to hosting our beloved elders for nearly one decade. 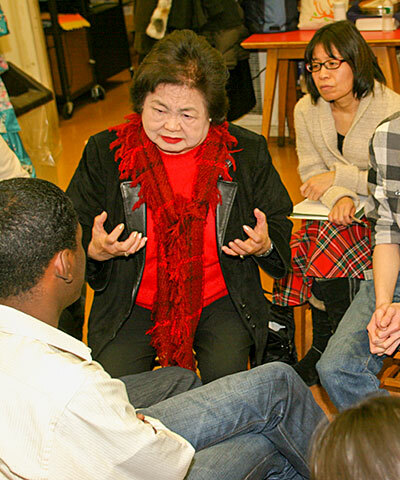 A key ingredient of Hibakusha Stories was creating an environment for comfort, care and sharing. After long days working in the schools, our friends were treated to home-cooked food by our master chef Hayato and relaxing surrounds were lasting bonds of friendship were formed and continue to grow. Check out our photo galleries for a taste of life outside the classroom. And of course, the Hibakusha page of our website is a rich resource of hibakusha testimony.